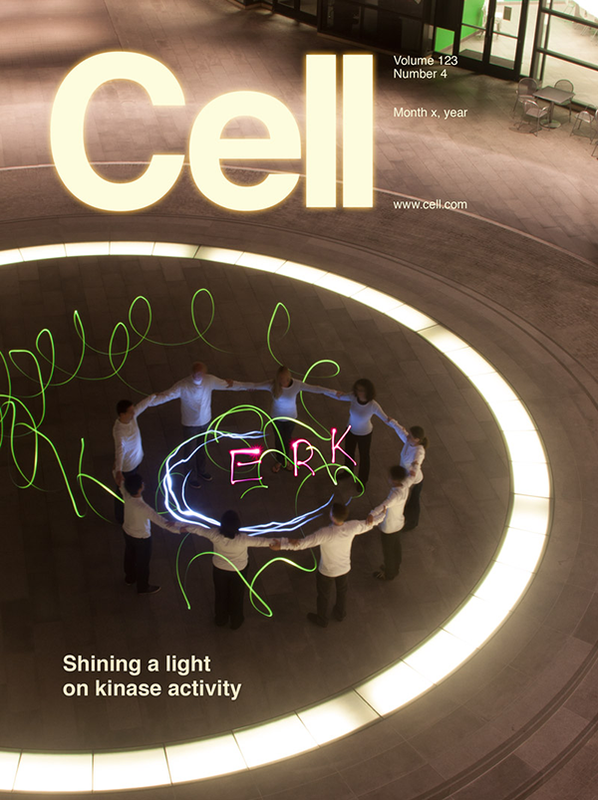 We turned to long-exposure photography and painting with light to create a representation of kinase activity for Covert Systems Biology lab at Stanford University. Their paper was accepted for publication by Cell magazine and we submitted this, along with a few other concepts, for cover consideration. We found a nice stage with an already-lit circular cell membrane in the courtyard of the Clark Center building that houses Dr. Covert’s lab. Lab members formed the nucleus and Dr. Covert’s two young children did the running around, impersonating reporter proteins with colored LED flashlights. You can see here the version we submitted, mocked up in the Cell template (“ERK” stands for extracellular-signal-regulated kinases).